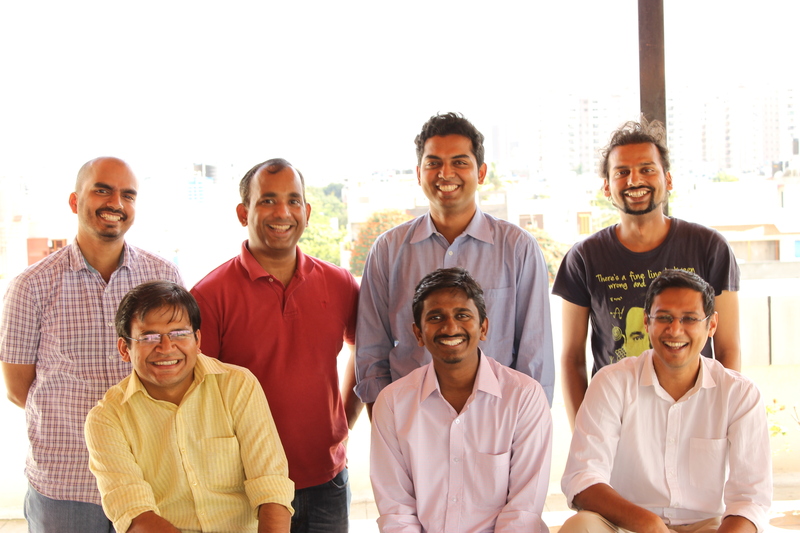 Goodbox’s co-founders Charan Shetty, Abey Zachariah, Nithin Chandra, Mahesh Herle (top row, left to right); Mohit Maheshwari, Anand Kelaginamani, Mayank Bidawatka (bottom row, left to right). Goodbox, a startup based in Bengaluru, wants to give small retailers a chance to take part in India’s e-commerce boom by making it easy to set up a store on its marketplace app. The company, which just raised a $2.5 million Series A from Nexus Venture Partners, sets itself apart from other online marketplaces with low transaction fees and unique features like in-app messaging that lets customers chat with merchants, recreating the kind of customer service they would get in a brick-and-mortar store. Goodbox charges each merchant about 1,000 rupees ($16) a year and a 1.99 percent transaction fee for each payment, which Zachariah claims is the same as having a credit card swipe machine in their stores. Since launching earlier this year, Goodbox has signed up over 1,200 merchants in Bengaluru, who serve a total of about 30,000 customers and manage their orders and inventory through the Goodbox partner app. The company claims the partner app lets vendors (which include supermarkets, restaurants, and service providers like movers, salons, and laundry chain) set up a mobile store in just a few minutes by using Goodbox’s tools or integrating their APIs. Consumers use the main Goodbox app to find nearby businesses and make cash-on-delivery or debit and credit card payments. Goodbox’s co-founders added a chat feature after observing that customers like to call businesses to ask questions about products or request things like extra toppings on food. Co-founder Mayank Bidawatka says Goodbox wanted to replicated the feel of messaging apps, since many Indian consumers use WhatsApp to chat with businesses. “There’s no learning curve. It’s asynchronous. We can allow for businesses to customize their chats, such as adding a checklist or menu,” says Bidawatka, noting that shoppers sometimes send photos of their shopping lists to a merchant instead of using an order form. “If you were to imagine WhatsApp with business profiles and menus, that is exactly what Goodbox is,” adds Zachariah. The company will use its Series A to improve its technology and expand within Bengaluru before looking for growth opportunities in other Indian cities. Goodbox’s seven co-founders include two early employees of redBus, the online bus ticketing platform that was sold to Ibibo Group in 2013 for about $100 million. Goodbox’s closest competitors are probably the large crop of hyperlocal startups in India that have received funding recently and also depend on connecting consumers with local merchants. Many hyperlocal startups aggregate local businesses on their apps and then handle payments and logistics for every order. Zachariah says that the main difference between those hyperlocal startups and Goodbox is that his company lets merchants maintain their own online presence, like a Facebook profile, and keep a larger amount of each transaction. While each business is expected to handle its own orders and deliveries, Goodbox gives them the option of signing up with RoadRunner, its logistic partner.